The kitchen design is something that needs to be considered carefully as there is so much to incorporate into the room. Professional kitchen designers will be able to make the most from any size of kitchen, fitting in all your appliances and necessary sockets. As the hub of your home it’s important to have something that you’re happy with and will make a big impression when you’re entertaining guests. By ensuring time and effort is spent on the kitchen and its design, you’ll be able to add value to your home. With the range available for products such as the worktops and flooring, you’ll be able to find something that’s both attractive and has all the necessary qualities. Your kitchen’s design will inevitably revolve around the worktop. The cabinets and the flooring especially will be based on which material and colour you opt for, so it’s worth spending time to consider your options. Marble and granite are two examples of natural stone worktops and their main quality is strength and durability. They can resist impacts whilst being hardwearing and water resistant. Combined, these properties make natural worktops an obvious choice for the kitchen and many designers will recommend this material. If you’re on a tight budget but still want to create a great look in your kitchen for little cost, laminate worktops could be your answer. 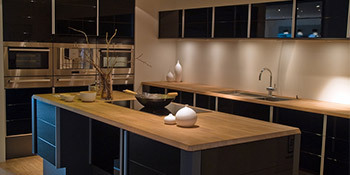 They’re made specially to replicate other materials, such as wooden or stone worktops. Laminate worktops will last for years but don’t have the same hardwearing properties of stone and can easily be scratched. This makes chopping boards a necessity. If it’s the aesthetic appeal you’re after, nothing beats wood as a worktop material. Wooden worktops are great for traditional looks and have some fantastic qualities for the kitchen including durability and water resistance. One problem is that they will scratch easily, but this is countered by cutting boards. Designing your kitchen can seem a nightmare with so much to consider. This is why using a professional to design and then install your perfect kitchen is the best route to take. If you’re interested in receiving up to four quotes from local, vetted and reputable companies, just complete our quick form. Project: In the kitchen, a new work surface, sink, end panels and cooker hood. In the cloakroom, new cloakroom sink and pipes boxed in. Project: I have bought a kitchen and require someone to knock down a wall and fit the kitchen for me..
Project: I am looking for someone to fit a new kitchen which is scheduled for delivery on the 6th June. There are 21 units to be fitted, electrical and plumbing plus floor tiling. A mixed bag, sadly. Dennis (the owner / designer) did visit quickly to discuss the design, and gave us a very competitive price for replacing our old kitchen. One of our other quotes used the same units / doors / appliances, and the price was very good by comparison. The product is fine - very nice units / doors, and we specified the brand we wanted for the appliances we needed (Bosch) so know these are good. However, as set out an an earlier review, what let the whole thing down badly was the appalling and shoddy workmanship by the fitter. Unfortunately, the fitter we had been promised, and had met, was not available, and was replaced at short notice. His replacement was what can only be described as a “Jack of all trades and master of none”. Our kitchen design is quite simple, and we were told it would take a week. The fitter was on site for 2 weeks, and when he left, the kitchen was not even complete, and we had a huge list of snags and issues. Unfortunately, during the fitting, Dennis had a family issue (and we are not unsympathetic to that) but it made contacting him difficult, he had to be away from home quite a lot of the time, and so was unable to effectively project manage. Dennis did provide an alternative fitter, who completed and cleared some of the issues, but not all. This work was to an acceptable standard. Ultimately, Dennis was open to discussion about financial compensation, which we will use toward completing the kitchen. As work is not complete even though was promised end of December 2017 now May 2018 and still not finished. Spend many hours chasing up taking time off work only to be let down time after time. The excuses given were just that excuses, always someone else's fault. Worthy of note this company does not take responsibility for the work done as it is all subcontracted out. All in all a very expensive lesson in how not to procure a quality service. Felt very let down and aggrieved by the whole process. I would advise to consider carefully before using Steve Brooks design as what is promised and what is delivered are poles apart. In this review the 4 stars are given based on the initial. Home consultation where timings, completion dates are all promised. Once money is handed over the actual service provided bears no resemblance to what is provided. I could go on, but in my opinion anyone must think very carefully before using this company. A couple of 'snags' regarding measurement and cupboards needing extra small 'fill in' panel. Waiting for either my tiles or money back on them. Job done in a day, small job. I was sent one contact, whom I employed. The 2 companies that sent surveyors were very pleasant and helpful. For this I thank you but Decided to go with local company. I found a good company and - I hope - a good deal, too. I gave four stars just because I only had one quote via my Quotatis request. It turned to be fine, but I had to find more tradesmen and quotes to compare myself. Properties are given an energy rating based on how efficient they are and ratings are displayed in the information underneath. This ranges from A, by far the most energy efficient, to G, the least efficient. With a higher rating you're more likely to have less expensive energy bills as more heat shall be retained in the house. It is possible to boost your home's efficiency with insulation including double glazing, loft lagging or wall cavity insulation. The information underneath indicates the diverse types of homes within Uk. By far the most commonplace properties across the UK are detached and semi-detached homes. Other kinds of households consist of terraced houses, flats, converted flats and bungalows. The data listed below offers an indication for the number of homes in Uk which are central heated and non-central heated. Houses are heated by a range of sources which reflect how expensive yearly energy bills are going to be. Types of central heating include gas, electricity, oil, solid fuel and LPG boilers. Changing the way your home is heated can see you with cheaper bills. The data below illustrates the spread of houses heated by different fuels. Throughout the UK the most frequent undoubtedly are gas heated properties, followed by electricity and then oil. Biomass boilers are also rising in popularity, heated by environmentally friendly products such as wood pellets or agricultural waste.|Houses in the UK are warmed by a variety of fuels, such as gas, electricity, oil, solid fuel and LPG boilers. Each fuel has a varying cost associated with it which means you can find yourself with cheaper energy bills by switching how your household is heated. Even solar thermal panels are being regarded as by many as a way to lower heating bills for the many years to come.